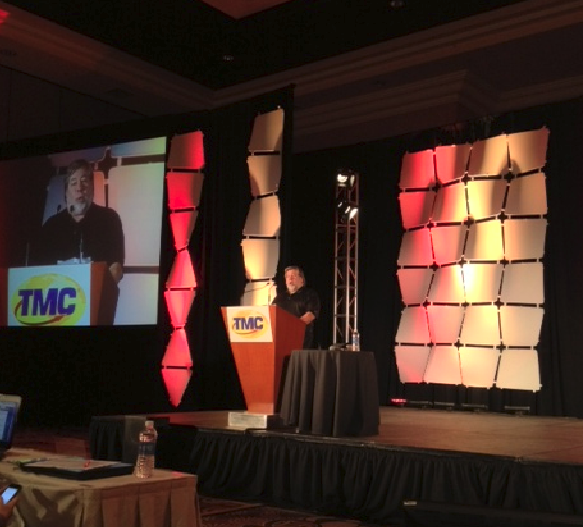 Steve Wozniak “the Woz”, Steve Job’s right-hand man was the featured keynote speaker at ITEXPO. I captured a few videos of him speaking. My plan was to capture just a single video, but my iPhone 4S rang (on vibrate) in the middle of me video recording and it stopped the video recording! Why did Apple put calling priority higher than video recording? Just show the CallerID popup and let the user achat cialis en ligne decide to take or not take the call, but don’t stop the video! I should have asked Steve that question during the press briefing after his keynote. Instead I asked him his thoughts about the current turmoil at the CEO level at Microsoft. In any case, here’s the first 11 minutes of his keynote. I may post the other parts later. I found his keynote to be fascinating and I’m amazed at how fast his brain works. He didn’t pause to take a breath while speaking – no uhhhs or ummms. Just continuous flow talking. He mentioned he was shy but after hearing him speak, he certainly doesn’t seem shy. Enjoy the video!